The Rio Grande, in Mexico known as the Rio Bravo del Norte- the great river, or the rugged river of the North, is described by the National Park Service as” a relentless gravity powered belt sander that has been running for millions of years”, has been designated by congress a” Wild and Scenic River.” The second largest river in the US, the Rio Grande rises near the continental divide in southwestern Colorado’s San Juan Mountains and flows 1900 miles to the gulf of Mexico. The Rio Grande is a symbol of the rugged landscapes of the southwest. It is the inspiration behind many a lore, and folktale of the west. Pecos Bill, a Texas legend has more times than not had adventures along the Rio Grande. Speaking of inspiration, the Rio Grande was one of the settings for the epic film “Giant” starring Elizabeth Taylor, Rock Hudson, and James Dean. For 1248 miles, the river winds and curves along the border of the US and Mexico. For much of that distance it follows a southeast course, but along the Chisos Mountains it begins its long bend to the northeast before it turns southeast again. This bend as it is known here is the elbow of the Big Bend signifying the wide open rugged spaces, wildly independent and creative people, and don’t forget our Hot Hot Chili cook off. Legend has it that there were a group of Native Americans before the Jumanos, and maybe even the Jumanos themselves that lived in the rock cliff caves along the river even before Cabeza de Vaca explored this untamed area. The Rio Grande was also the stomping grounds and home of the Comanche’s, and they traveled beside and through the river. Keep your eyes peeled for the Comanche trails. There is always an adventure waiting to happen in the Big Bend especially along the river. Make sure you keep your eyes open and your senses in full gear or you just might miss that rare peregrine falcon or red tailed hawk soaring above, or you might miss the catfish roll just beneath your paddle as you pass beneath the cliff swallow nests above you in the canyon. 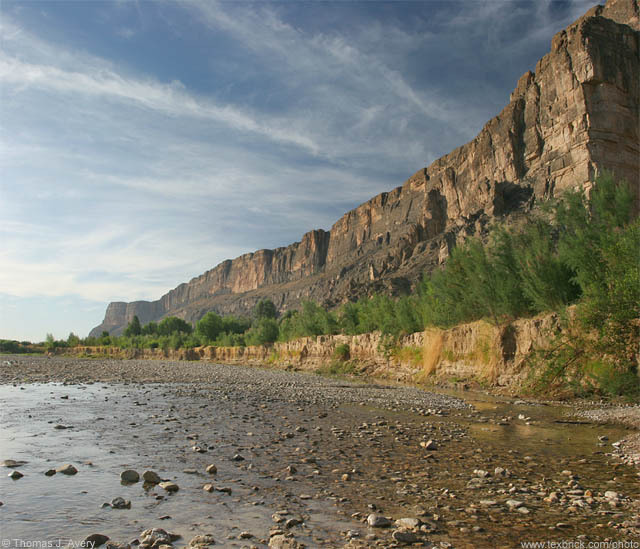 Much of the volume of the water of the big bend comes from the Rio Conchos which enters the Rio Grande from Mexico. Typically speaking we are blessed with a few releases a year from the Rio Conchos and those typically happen in the fall, and at times in the spring. If you are lucky to catch a release you will be rafting down the Rio Grande. But don’t let the releases stop you from enjoying a river trip. The outfitters here run rain or shine, with lots of water to droplets. 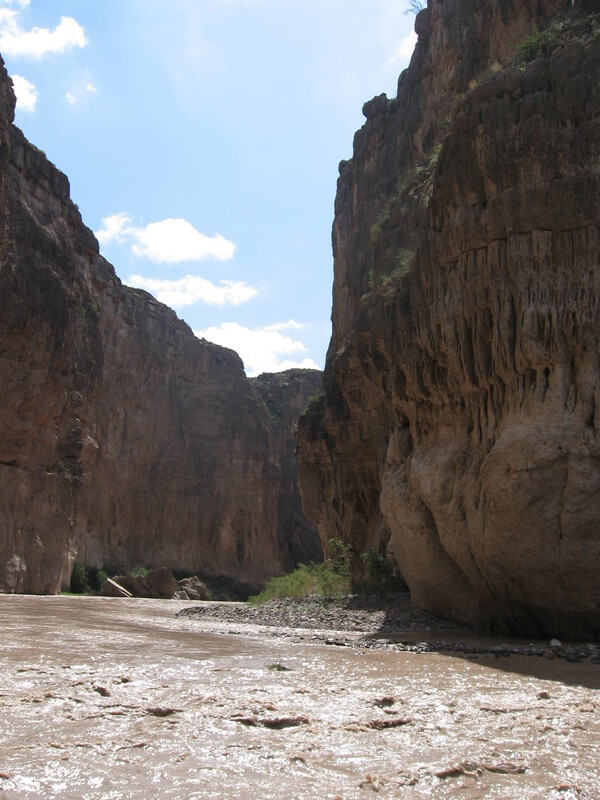 When the water is five feet and above you can be sure to raft Santa Elena canyon, if it is 3-5 feet you can raft Colorado canyon, and if it is below 3 feet you will canoe the Santa Elena canyon. So any way you have it you can get on the water. But be sure to call the outfitters early as space books up quickly. The outfitters in the Big Bend are: Far Flung Outdoor Center 1-800-839-7238, 432-371-2346; Desert Sports 1-888-989-6900, or 432-371-2727, and Big Bend River Tours-1-800-545-4240, or 432 371-3033. 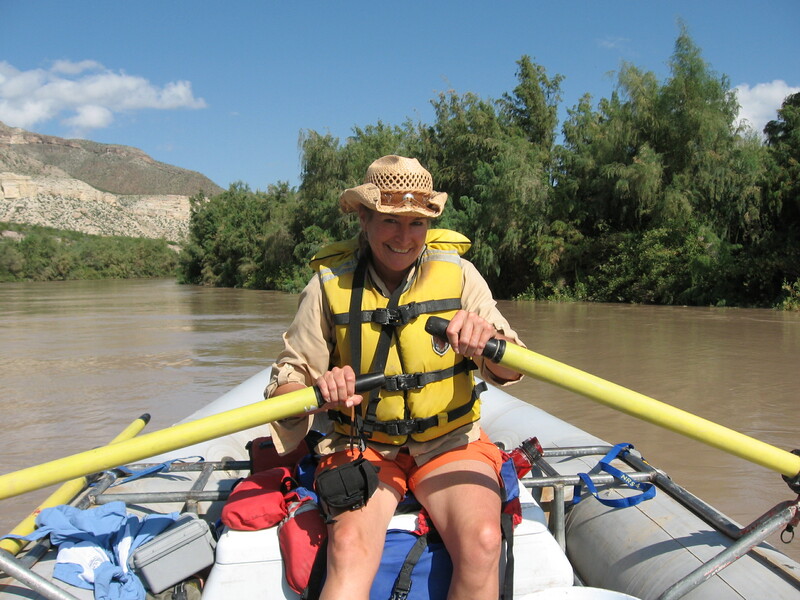 Look forward to seeing you for an adventure on the wild and scenic Rio Grande River in the Big Bend!